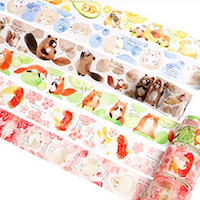 4) Please rate a 5 if you receive a minimum of five different 15 inch washi samples, of which at least three are animal themed. Does unicorn count as a animal? Hmm. Well it is a horse with a pointy thing on its head so I guess it counts. Do paw prints etc count or only the actual animal? Paw prints are okay, but for example a tape that only has pictures of dog bones or toys without any actual animals or paw prints on it doesn't qualify.